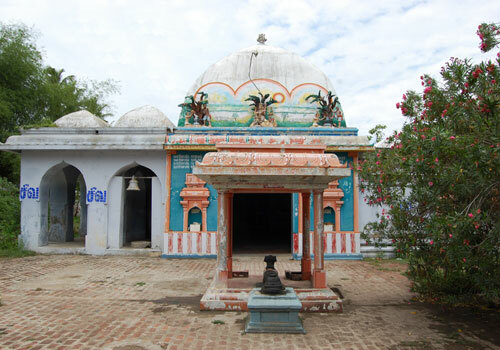 The temple is praised by Saint Tirunavukkarasar in his Thevaram hymns.This is the 40th Lord Shiva temple on the northern bank of Cauvery praised in Thevaram hymns. 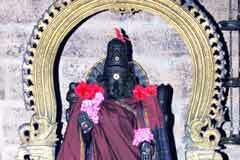 Lord Chandeswarar Brahmmotsavam is celebrated the new moon day following Shivrathri in February-March. Lord Shiva is a Swaymabumurthy. 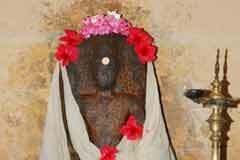 The temple is open from 7.00 a.m. to 11.00 a.m. and from 5.00 p.m. to 7.30 p.m.
Sri Palukanda Nathar Temple, Tiruvaipadi-612 504, Tirupanandal post, Tiruvidaimarudur Taluk, Thanjavur district. 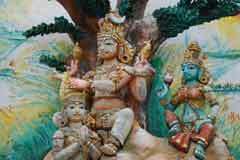 Devotees offer vastras to Lord and Mother and contribute to temple renovation funds. Chandikeswara among the 63 Nayanmars is the only one with Easwara title. Seignalur near this place is his birth place. 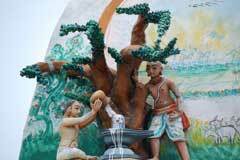 Tiruvaipadi is the place where he installed Linga and worshipped and attained salvation. His shrine is close to the sanctum sanctorum. Visara Saruman was the son of a Brahmin Echathan and Pavithra. He learnt all arts in his young age. 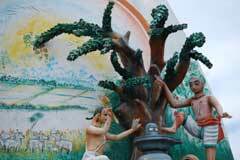 His Upanayanam-sacred thread ceremony was performed when he was seven. He had no thoughts in mind but Lord Shiva alone. He saw a shepherd beating a calf that attempted to hit him. Visara Saruman took the job from him and cared for the cattle. As he was as kind as a mother, the cows produced plenty of milk. As Visara Saruman was always drowned in Shiva thoughts, he made a Linga with the sands of Manniyar River, installed it under an Aathi tree and performed pujas and abishek with the milk he got from the cows. The cows also gave high measures of milk to their owners too. Those who saw Visara Saruman performing abishek to Lord with the milk of the cows, complained that he was wasting the milk meant for yajnas. His father too saw him doing pujas abishek from a hiding. The angry father beat him and upset the milk pots. As Visara Saruman was deep in his worship, not knowing the person upsetting the milk pots, attacked him with a stick, still continuing his worship. The stick turned into an axe and cut the legs of the father. Lord along with Mother Parvathi granted darshan to Visara Saruman and said that he cut his father’s legs because of his devotion and thenceforth He would be his father and honoured with Kondrai flower garland He was wearing then. Lord also named him Chandikeswara. As the Lord was happy to accept the milk-Paal in Tamil, He is praised as Paal Ukantha (accepted) Nathar-Lord, Paal Ukantha Nathar. As Visara Saruman grazed the Aas-Cows, the place came to be known as Aipadi. 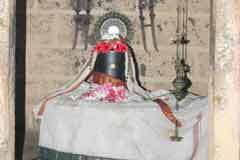 Miracle Based: Lord Shiva in the temple is a Swayambumurthy. 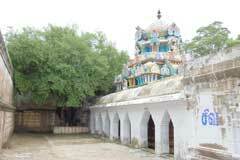 Tirupanandal is 18 km from Kumbakonam on the Chennai road. Tiruvaipadi is near Tirupanandal.